So, most nights at my house I usually just “make up” dinner. You know what can I make with what I already have because there is no way I’m going across town to the grocery store. This was one of those nights. I had ground beef already cooked up from a previous meal the night before and went rummaging through my fridge and cabinets to try to figure out what I could make. Basically, I heated up the ground beef in a skillet with the chopped onions. Then added everything else and simmered till the onions were soft. 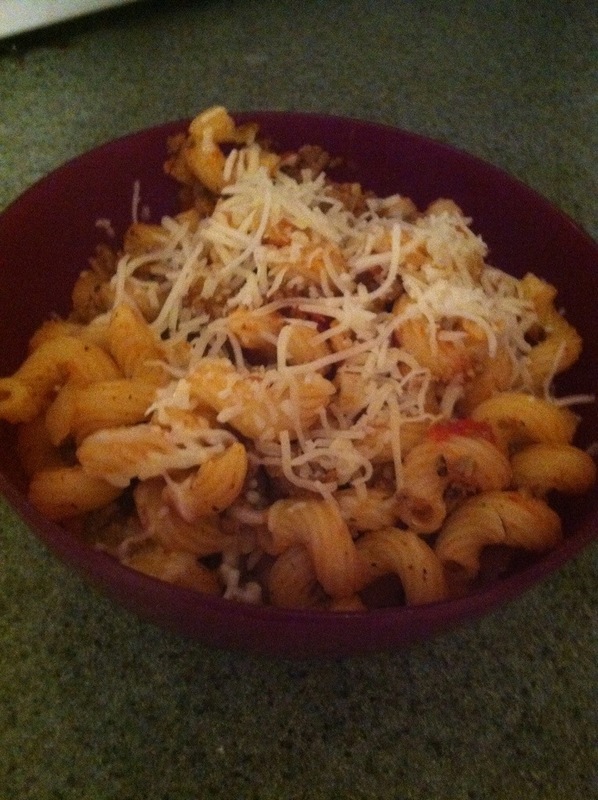 Mix in the pasta and top with cheese to serve. This makes a good amount and we even had a container to go into the freezer for another night. Of course over the weekend my freezer was acting up, so we ened up eating the leftovers a little sooner than I had planned, but that’s another story.